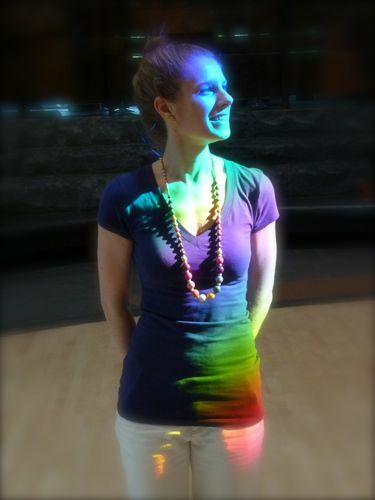 My coworker/5Rhythms classmate left yesterday for a yoga nidra workshop at Kripalu. A whole week of savasana…now that’s a relaxing retreat! Instead of being insanely jealous about her vacation, I decided to bring a little bit of Kripalu into my own Sunday morning. 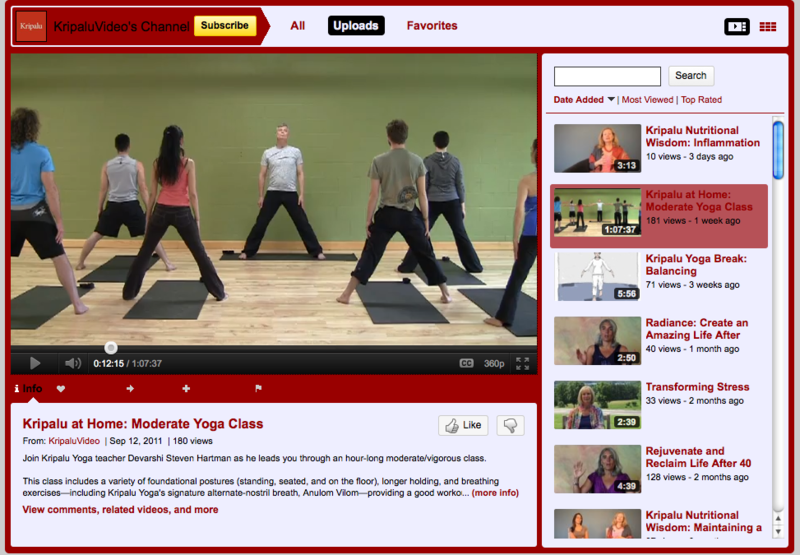 About a week ago, Kripalu uploaded a video of a full-length moderate yoga class to its YouTube channel. This was a wonderful surprise, because up until then most of the videos were just short yoga breaks or interviews with staff/experts. This class was an hour long; led by one of Kripalu’s leading men, Devarshi (Steven Hartman); and had all the elements of an authentic Kripalu yoga class offered at the actual center. I spread out my yoga mat on the living room floor, opened the blinds to let in the sunlight, and began. The class started with one of my favorite pranayama exercises: alternate nostril breath. Sadly, not many classes I attend at home dedicate time solely to breathwork, so I was thrilled to sit and focus on my inhalations and exhalations. I honestly believe that starting practice with focused breathing brings everything to center and really gets the mind, body, and spirit connected before moving on. I don’t think I’ve ever attended a Kripalu yoga class that doesn’t start with pranayama, and some end with it as well! Another Kripalu trademark is long posture holds, which made its appearance during a simple standing position. Devarshi instructed us to hold our arms to the side in a T, palms facing out. Sounds simple, right? But then we held it. And held it. And continued holding our arms out. We made small circles going one way. Small circle in the other direction. Devarshi encouraged us to think positive thoughts (“My arms are strong!”) rather than the negative thoughts that first come to mind (“This is haarrrrddd!”). We breathed through it, relaxing and smiling into the stretch. There is such a fine line between wanting to give up and finally getting over that mental block of a hump and being OK with the warm sensations running through the chest, shoulders, arms, and hands, maybe actually enjoying it. One of my favorite postures of the practice turned out to be one of most dreaded poses: utkatasana, chair pose. But the way Devarshi eased us into it–first just a slight bend at the knee, add a little bounce, arms loose, wrists relaxed–felt natural and tolerable. The best part was when he adding a little “snap” to the pose, guiding us to snap our fingers and sway our hips side to side, like a number in a Bob Fosse show. Holy crap, was I actually enjoying this rather long hold of utkatasana?! So if you’re ever stuck at home and don’t have time for a studio class, I wholeheartedly recommended this little gem of a YouTube video, especially if you’re familiar with the Kripalu style or curious about what a typical Kripalu class is like. The only thing missing was being able to roll up my mat; step outside for a deep breath of that cool, crisp Berkshire Mountain air; and enjoy my silent breakfast surrounded by other blissed-out yogis. 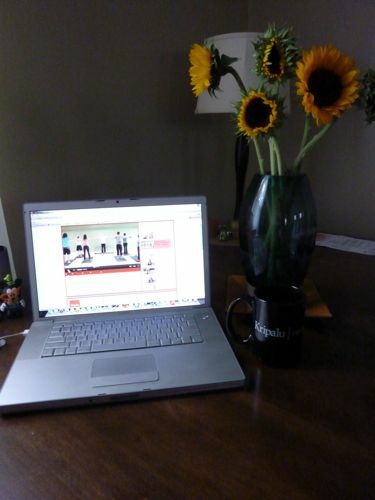 Instead, I poured my morning coffee in the black Kripalu mug that got me through all 28 days of training and enjoyed my breakfast next to the sunflowers from this weekend’s farmers market. Not quite a mountain retreat but I felt just a little closer to home. Thanks for sharing! I definitely don’t push myself to do certain things, like holding my arms up, without the instruction of a teacher. 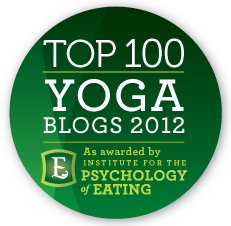 I’ve never gone on the internet to find yoga videos, but it would be nice to switch things up. 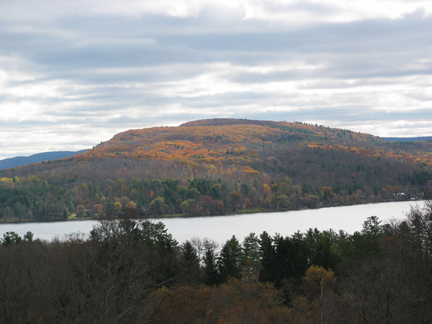 Very nice, thanks for the intro to Kripalu. I will have to check it out! The fierce chair with a snap sounds like fun! Yeah, kundalini yoga is the king of long holds! Yet I always emerged from those classes feeling so strong and buzzed. You just have to get over that initial freaking out hump. OK, the “moderate” level terrifies me, but I may have to try this one. I have yet to find an at-home class that actually features a warm-up, and my body’s so creaky that I NEED it. I miss those Kripalu classes!! Don’t let the moderate label scare you away! It’s really not that hard, and you know you can always modify if need be. There are no sun salutations, no chaturangas, no crazy balancing poses–go for it! And if you need a yoga class with a warm-up, this one is definitely IT.